Anton Zaslavski (born 2 September 1989), kent primarily bi his stage name Zedd, is a Roushie-German muisicker, electronic muisic producer an DJ. He primarily produces in the electro house genre, but haes branched oot, drawin influences frae progressive hoose, dubstep, an clessical muisic. ↑ 1.0 1.1 Heaney, Gregory. "Allmusic: Zedd (Biography)". AllMusic. Rovi Corporation. Retrieved 1 September 2013. ↑ O'Malley Greenburg, Zach (14 August 2013). 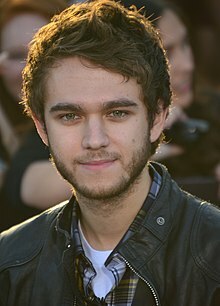 "Zedd Ahead: Meet The Next Big Star Of Electronic Music". Forbes. Retrieved 7 December 2013. ↑ "ELR™ Exclusive Interview w/ Zedd | EasyLove Records™ | Electronic Music Blog". Easyloverecords.com. 19 November 2010. Retrieved 7 November 2012. ↑ "VOTE NOW! Help Decide The Next Pop Superstar of 2013!". popdust.com. Retrieved 10 August 2013. ↑ "2013 Video Music Award Nominations: Get The Full List!". MTV. Retrieved 27 August 2013. ↑ "'American Music Awards' 2013 nominees, winners – complete list". ↑ "Grammy Awards 2014 Nominations, Dance Genre". ↑ "2014 Winners". Billboard Music Awards. Retrieved 2014-05-19. Wikimedia Commons haes media relatit tae Zedd. This page wis last eeditit on 13 Mey 2018, at 00:12.